Iconoclasm is the deliberate destruction within a culture of the culture's own religious icons and other symbols or monuments, usually for religious or political motives. It is a frequent component of major political or religious changes. It is thus generally distinguished from the destruction by one culture of the images of another, for example by the Spanish in their American conquests. The term is also not generally used of the specific destruction of images of a ruler after his death or overthrow (damnatio memoriae), for example Akhenaten in Ancient Egypt. People who engage in or support iconoclasm are called iconoclasts, a term that has come to be applied figuratively to any person who breaks or disdains established dogmata or conventions. Conversely, people who revere or venerate religious images are called iconodules in a Byzantine context, or iconophiles. Iconoclasm may be carried out by people of a different religion, but is often the result of sectarian disputes between factions of the same religion. The two Byzantine outbreaks during the 8th and 9th centuries were unusual in that the use of images was the main issue in the dispute, rather than a by-product of wider concerns. In Christianity, iconoclasm has generally been motivated by a literal interpretation of the Ten Commandments, which forbid the making and worshipping of "graven images". A thorough understanding of the Iconoclastic Period in Byzantium is complicated by the fact that most of the surviving sources were written by the ultimate victors in the controversy, the iconodules. It is thus difficult to obtain a complete, objective, balanced, and reliably accurate account of events and various aspects of the controversy. Major historical sources for the period include the chronicles of Theophanes the Confessor  and the Patriarch Nikephoros, both of whom were ardent iconodules. Many historians have also drawn on hagiography, most notably the Life of St. Stephen the Younger, which includes a detailed, but highly biased, account of persecutions during the reign of Constantine V. No account of the period in question written by an iconoclast has been preserved, although certain saints' lives do seem to preserve elements of the iconoclast worldview. As with other doctrinal issues in the Byzantine period, the controversy was by no means restricted to the clergy, or to arguments from theology. The continuing cultural confrontation with, and military threat from, Islam probably had a bearing on the attitudes of both sides. Iconoclasm seems to have been supported by many from the East of the Empire, and refugees from the provinces taken over by the Muslims. It has been suggested that their strength in the army at the start of the period, and the growing influence of Balkan forces in the army (generally considered to lack strong iconoclast feelings) over the period may have been important factors in both beginning and ending imperial support for iconoclasm. This page of the Iconodule Chludov Psalter, illustrates the line "They gave me gall to eat; and when I was thirsty they gave me vinegar to drink" with a picture of a soldier offering Christ vinegar on a sponge attached to a pole. Below is a picture of the last Iconoclast Patriarch of Constantinople, John the Grammarian rubbing out a painting of Christ with a similar sponge attached to a pole. John is caricatured, here as on other pages, with untidy straight hair sticking out in all directions, which was considered ridiculous by the elegant Byzantines. Sometime between 726-730 the Byzantine Emperor Leo III the Isaurian ordered the removal of an image of Jesus prominently placed over the Chalke gate, the ceremonial entrance to the Great Palace of Constantinople, and its replacement with a cross. Some of those who were assigned to the task were murdered by a band of iconodules. Writings suggest that at least part of the reason for the removal may have been military reversals against the Muslims and the eruption of the volcanic island of Thera, which Leo possibly viewed as evidence of the wrath of God brought on by image veneration in the Church. Leo is said to have described image veneration as "a craft of idolatry." He apparently forbade the worship of religious images in a 730 edict, which did not apply to other forms of art, including the image of the emperor, or religious symbols such as the cross. "He saw no need to consult the church, and he appears to have been surprised by the depth of the popular opposition he encountered". Germanus I of Constantinople, the iconodule Patriarch of Constantinople, either resigned or was deposed following the ban. Surviving letters Germanus wrote at the time say little of theology. According to Patricia Karlin-Hayter, what worried Germanus was that the ban of icons would prove that the Church had been in error for a long time and therefore play into the hands of Jews and Muslims. In the West, Pope Gregory III held two synods at Rome and condemned Leo's actions, and in response Leo seized some papal lands. During this initial period, concern on both sides seems to have had little to do with theology and more with practical evidence and effects. Icon veneration was forbidden simply because Leo saw it as a violation of the biblical commandment forbidding the manufacture and veneration of images. There was initially no church council, and no prominent patriarchs or bishops called for the removal or destruction of icons. In the process of destroying or obscuring images, Leo "confiscated valuable church plate, altar cloths, and reliquaries decorated with religious figures",  but took no severe action against the former patriarch or iconophile bishops. The Iconoclast Council of Hieria was not the end of the matter, however. In this period complex theological arguments appeared, both for and against the use of icons. The monasteries were strongholds of icon veneration, and an underground network of iconodules was organized among monks. John of Damascus, a Syrian monk living outside of Byzantine territory, became the major opponent of iconoclasm through his theological writings. Another, Theodore the Studite, wrote a letter against the emperor to Pope Paschal, an act with strong political implications. In a response recalling the later Protestant Reformation, Constantine moved against the monasteries, had relics thrown into the sea, and stopped the invocation of saints. Monks were apparently forced to parade in the Hippodrome, each hand-in-hand with a woman, in violation of their vows. In 765 Saint Stephen the Younger was killed, apparently a martyr to the Iconodule cause. A number of large monasteries in Constantinople were secularised, and many monks fled to areas beyond effective imperial control on the fringes of the Empire. Constantine's son, Leo IV (775-80) was less rigorous, and for a time tried to mediate between the factions. Towards the end of his life, however, Leo took severe measures against images and would have banned his wife Irene, who was reputed to venerate icons in secret. He died before achieving this, and Irene took power as regent for her son, Constantine VI (780-97). With Irene's ascension as regent, the first Iconoclastic Period came to an end. Irene initiated a new ecumenical council, ultimately called the Second Council of Nicaea, which first met in Constantinople in 786 but was disrupted by military units faithful to the iconoclast legacy. The council convened again at Nicea in 787 and reversed the decrees of the previous iconoclast council held at Constantinople and Hieria, and appropriated its title as Seventh Ecumenical Council. Thus there were two councils called the "Seventh Ecumenical Council," the first supporting iconoclasm, the second supporting icon veneration and negating the first. 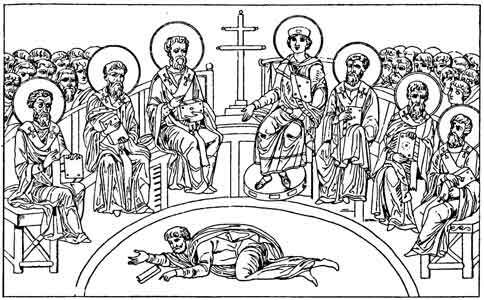 Unlike the iconoclast council, the iconodule council included papal representatives, and its decrees were approved by the papacy. Eastern Orthodoxy today considers it the last genuine ecumenical council. Icon veneration lasted through the reign of Empress Irene's successor, Nicephorus I (reigned 802-811), and the two brief reigns after his. Emperor Leo V the Armenian instituted a second period of Iconoclasm in 813, again possibly motivated in part by military failures seen as indicators of divine displeasure. Once again the icon of Christ over the Chalke gate was replaced with a cross. Leo was succeeded by Michael II, who in an 824 letter to the Carolingian emperor Louis the Pious lamented the appearance of image veneration in the church and such practices as making icons baptismal godfathers to infants. He confirmed the decrees of the Iconoclast Council of 754. Michael was succeeded by his son, Theophilus. Theophilus died leaving his wife Theodora regent for his minor heir, Michael III. Like Irene 50 years before her, Theodora mobilized the iconodules and proclaimed the restoration of icons in 843, on the condition that Theophilus not be condemned. Since that time the first Sunday of Lent has been celebrated in the Orthodox Church as the feast of the "Triumph of Orthodoxy". Regarding the written tradition opposing the making and veneration of images, they asserted that icons were part of unrecorded oral tradition (parádosis, sanctioned in Orthodoxy as authoritative in doctrine by reference to 2 Thessalonians 2:15, Basil the Great, etc.). That practice continued from beginning to end of the Iconoclastic controversy and beyond, with some emperors enforcing iconoclasm, and two empresses regent enforcing the re-establishment of icon veneration. One distinction between the iconoclastic emperors and Constantine I is that the latter did not dictate the conclusion of the First Council of Nicaea before summoning it, whereas Leo III began enforcing a policy of iconoclasm more than twenty years before the Council of Hieria would endorse it. 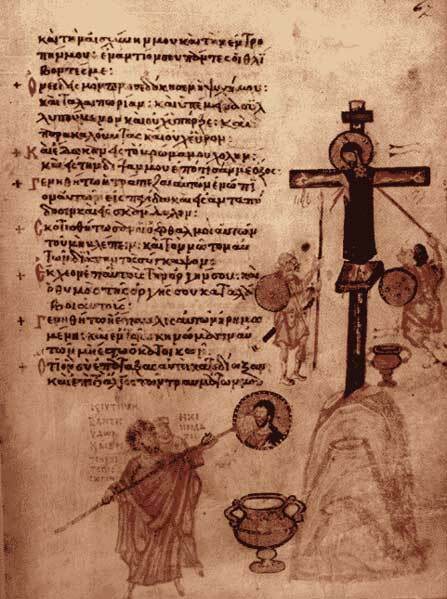 ^ L. Brubaker and J. Haldon, Byzantium in the iconoclast era (ca. 680-850): the sources (Birmingham, 2001). ^ M.-F. Auzépy, tr., La vie d’Étienne le jeune par Étienne le Diacre (Aldershot, 1997). ^ I. Ševčenko, "Hagiography in the iconoclast period," in A. Bryer and J. Herrin, eds., Iconoclasm (Birmingham, 1977), 113-31. ^ M.-J. Mondzain, tr., Discours contre les iconoclastes (Paris, 1989). ^ a b The Oxford History of Byzantium: Iconoclasm, Patricia Karlin-Hayter, Oxford University Press, 2002.